A GRIP ON SPORTS • The question has to be asked as we enter the last few days of August. It has to be asked of the Mariners and their fans. Where are we now? Read on. • A rookie with just a few games under his belt was pretty darn good last night. So was the veteran with hundreds of them. But not good enough, which is the second paragraph of Felix Hernandez’s career obituary. When Hernandez retires, quite possibly after the 2019 season, the fact he pitched so well, so often but didn’t earn a win will be the second-most important fact of his Seattle tenure. 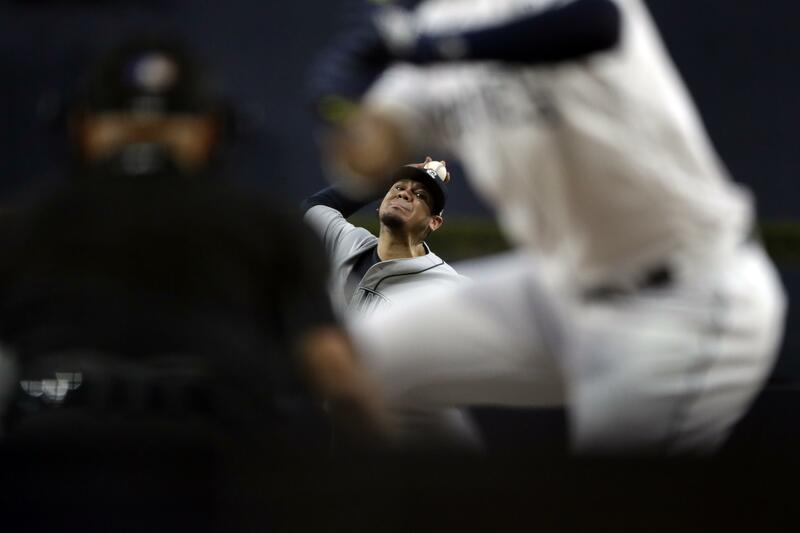 His performance – seven innings, four hits, two earned runs, two walks and nine strike outs – is encouraging for the rest of the season but only partially helps us answer the question. 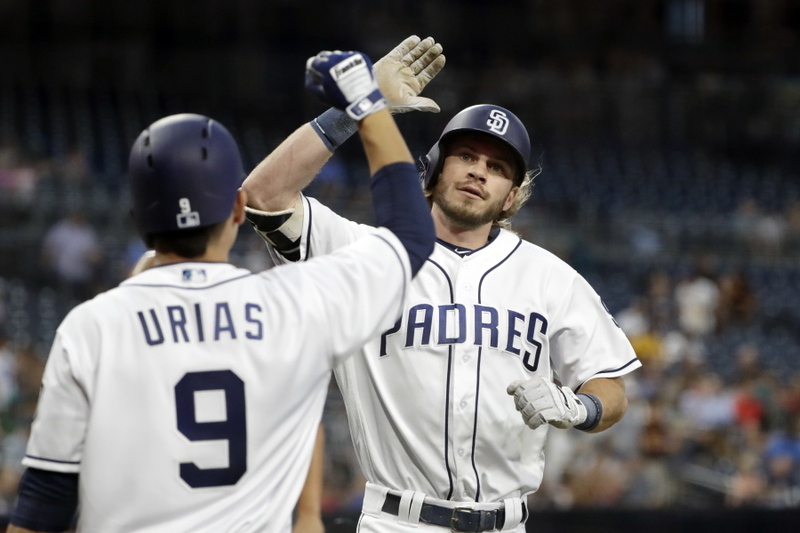 After last night’s 2-1 loss in San Diego – Nelson Cruz’s ninth-inning solo home run was the only thing Jacob Nix screwed up all night and it drove him from the game – the Mariners are 74-58. They are 5.5 games behind the Athletics for the second wild card and 7 behind the Astros is the West. Their postseason chase may be over before Labor Day. If it is, they will look back at games like last night, a tough loss to a lousy team, and see within it the seeds of their demise. As far as the M’s are concerned, interleague play can just go away. The National League West has hurt them. With three games left with the woeful Padres (one today in San Diego, two in September in Seattle), the Mariners are 4-9 against the division. That’s after a series win against the West-leading Diamondbacks earlier this trip. Oh, sure, Oakland hasn’t blown up its National League opponents either – the A’s are 8-6 against the West – but much of the edge it has on Seattle comes from those games. That’s where we are now. Except for one little thing. The Mariners and the A’s play seven more times, starting Thursday in Oakland. Both teams are hurting. Both have recently placed starting pitchers on the disabled list. But Oakland has one big edge. The A’s are 5.5 games up in the standings thanks, in large part, to the National League West. • By the way, Hernandez’s outing last night was the 19th time in his career he’s pitched at least seven innings, given up two or fewer runs and lost. WSU: As is usually the case, there are a lot of connections between the coaches on the staffs that will face off Saturday. Theo Lawson has a story on the Cougar coaches’ run-ins with Wyoming’s Craig Bohl. … Theo also has his first Pac-12 power rankings of the season. He has the Cougars ranked eighth. I would probably flip them with ninth-ranked California, considering what the teams have returning. … If you want post-practice interviews, Theo has posted ones with Mike Leach and special teams coach Matt Brock. … The Cougars released their complete nonconference basketball schedule yesterday and Theo has a story on that as well. … Theo will hold an on-line chat today starting at 10 a.m. Larry Weir connected with a former S-R staffer for yesterday’s Press Box pod, talking with The Athletic’s Christian Caple about the Huskies. … WSU’s starting quarterback? Leach wants everyone to show up to find out. … Finally, the Pac-12 honored a WSU soccer player. Elsewhere in the Pac-12, there are newcomers sprinkled all over the conference. Jon Wilner ranks a dozen based on their importance to their teams. … Who is playing quarterback is a key question at a lot of schools. If the Pac-12 is to shine nationally, every quarterback will lead the way. … Washington should be the conference standard-bearer but only if its offense can hold play together. … Oregon State is pleased with Jake Luton’s play. … The defense is always the question at Oregon. … The lights went out on Stanford and San Diego State last season. … California has a new kicker this season. … The Colorado defense is experienced but on the other side, a running back is missed. … Utah’s present is different than its past or future. … UCLA and its opening opponent, Cincinnati, are both somewhat of a mystery. … So is USC’s quarterback, freshman JT Daniels. … The Arizona State offensive coordinator is not afraid to take risks. … Arizona welcomes back a hard-hitting safety. Gonzaga: Around the WCC, BYU picked up a commitment, though Casey Brown will take his LDS mission first. EWU: Not only is Saturday’s game between the Eagles and Central Washington the season opener, it is a reunion of sorts. The Wildcats’ quarterback, Reilly Hennessey returns to Cheney. Ryan Collingwood has this story about his homecoming. … Around the Big Sky, Idaho State is looking for a new athletic director. … Weber State’s coaching staff has a lot of connections to opening opponent Utah. … UC Davis opens with San Jose State looking to answer questions. … A Southern Utah player would like to make a mark. … Northern Colorado’s schedule isn’t easy. … Montana will have its hands full. … The same can be said for Montana State. Chiefs: Spokane reached agreement with a 16-year-old player for the season. … Elsewhere in the WHL, Everett is still making roster decisions. Mariners: The loss was the most important thing that happened yesterday, though you may not have realized it, considering how much attention was paid to Scott Servais’ haircut. … The M’s made a roster move yesterday to shore up the pitching staff. Seahawks: Though the Hawks are trying to make themselves younger, some of the stars are aging. That means injuries. Doug Baldwin is dealing with one. So is K.J. Wright. Published: Aug. 29, 2018, 8:44 a.m.